I was doing some drawing yesterday for my next MTV column. I'm not much of an illustrator, but I can make something generally recognizable. (Which gets to the point of my next column, and why you don't see more Sean Kleefeld originals around!) The "finished" art was a little sketchy by design, but it looks like a cartoon of two people talking. Mid-range shot, so you just see from the torso up. Most of it is serviceable, but I rather liked the hands. Well, not the actual linework or anything, but the basic pose and composition of the hands looked decent, I thought. Especially given the size and level of detail I was aiming for. They looked like they were in a fairly natural pose. The reason for that is that, back when I was still young and thinking about being a comic book artist for a living, I was looking at how comic book artists drew hands. 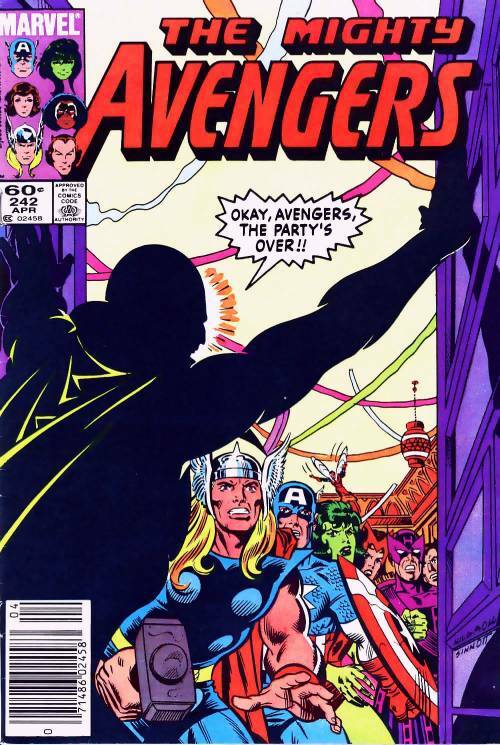 For some reason, Avengers #242 with Al Milgrom/Brett Breeding art stands out. There was a panel of the Vision just standing there with his hand at his side. And there was this interesting bit where his thumb and index finger were clearly visible, but his remaining three fingers were shadowed. But you could still distinguish the individual fingers because they all curled a little differently. It was subtle bit, but it caught my eye for some reason. I guess it was just a very natural-looking hand gesture and, because most of it was in shadow, fairly easy to draw. Since then, I would tend to notice when artists drew particularly smooth, natural gestures and tried to copy them. I did enough copying that, when I was drawing yesterday, I didn't use a hand model but still got some decent poses. But -- and here's the critical bit -- it's essentially copied from other artists. Not copied verbatim; I didn't have any reference in front of me, but copied in the sense that my anatomy of hands is based on the works of others, not on actual hands. I took some drawing classes in high school and college. I can recall that we spent a couple weeks on hands, in fact. Set our own hand down in front of us and draw it. When we finished, we'd change our position and draw it again. (Heh. I recall once contorting my hand in such a way that only three fingers were visible. I'd been on an ElfQuest kick at the time!) But that was two weeks of drawing hands from real life. The same is generally true of most of my art. I learned to draw women's lips by copying Mort Walker. I studied John Byrne's faces. Musculature care of George Perez. Feet via Mike Zeck. Which is why I'm not a very good artist. I'd spent time studying interpretations of anatomy instead of actual anatomy. I never really fully studied how joints and muscle and tendons connect together in real life. So anything I put down on paper is my interpretation of somebody else's interpretation of the human body. And that's why it will always remain, at best, serviceable. It's all well and good to study other artists and writers to see how they handle certain things, but the closer you can get to actual source material -- the more you study anatomy or human interactions or whatever -- the better and more successful you can be as a creator.